You might want to rethink feeding your infant certain suggested starter foods after this major revelation. Just because a snack is marketed as an appropriate "first finger food," doesn't make safe for your baby, according to new research, which has raised concerns about the safety of many of the products that carry this label. The American Academy of Pediatrics characterizes safe first foods as small, soft and easy to swallow. According to the AAP, babies should start trying these foods when they're able to sit up without support and bring their own hands to their mouths. The foods should be bite-sized, but size alone won't make them safe for consumption at such a young age—the food should also be soft enough to dissolve when put into someone's mouth, even if teeth aren't used to break down the bite. Researchers wore blindfolds to taste nine products that were marked as first finger foods (examples included Gerber Crawler products and cereals meant to be eaten as finger food.) Each item was sampled at random four times and researchers assessed the safety of the food by taking into account the amount of time it took for each bite to dissolve and become easy to swallow. Nicol Awadalla, M.D., led the study and said that there was a great deal of variability in the sizes, shapes and consistencies of the products, despite the fact that they were all meant for babies in the same age range. For example, some products needed to be manually broken down to be bite-sized for an infant. According to the researcher, only two of the products that were tested met all AAP criteria. Four of the nine products raised choking concerns and two of the products tested took longer to dissolve in the mouth after they had been left out for a few hours. We know what you're thinking—which products should you avoid feeding your infant at this point? Unfortunately, the team behind this research is not releasing he names of the products at this time—but the researchers will notify the companies that make the products that don't seem completely safe. "Not all products marketed for children have been tested in real-life situations," senior investigator Ruth Milanaik, D.O., said. For example, "parents need to be aware that changes in consistency can occur in food products that are left out of the packaging for extended periods of time, resulting in a possible choking hazard." The researchers will need to delve deeper to categorize foods that may be unsafe for infants depending on different stages of oral development. 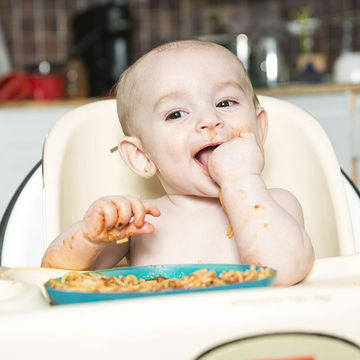 It's important to note, though, that while crawling is a major milestone in a baby's life, it doesn't have anything to do with oral development, so using it as a benchmark to determine when a baby can eat certain foods (as in the case of "crawler" foods, which are marketed as ideal for babies to eat when they begin crawling) is not a good idea. For now, here's what we suggest: Try first finger foods before offering them to your kids. If you find they don't dissolve easily, they might not be right for your baby.